by artist and author Elizabeth Andrews. Drawing inspiration from British folk tales, Celtic myths and the Faerie Realm, Elizabeth has created a magical selection of faerie artwork which can be purchased either as Greeting Cards or Art Prints. If you have visited us at one of our many shows and have seen something on the stall that is not available on the website please contact us, we'll be pleased to post anything for you. For your security and protection we use Paypal as our payment provider (you do not need an account). Please contact us if you require an alternative. We value your comments. Thank you for visiting our site and we hope you enjoy the Faeries. Need an unusual Personalised Gift or Keepsake? 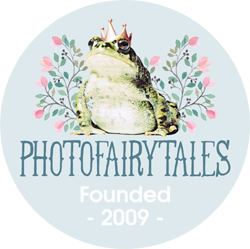 PhotoFairytales produces wonderful unique and unusual personalised presents, created individually to order every time and perfect for any occasion. Free delivery within the UK. Kindred Spirit Magazine (issue July/ Aug 2016) have kindly included my article 'Hedgerows as Food and Medicine' detailing the folklore and medicinal uses of our common plants found in British hedgerows.